The next DBA army was decided a few weeks ago when I wanted to have a closer look at Irregular Miniatures 15mm figures. I ended up deciding on Khmer as I wanted some more Asian influence in my collection. This is another Book III army (III/23) ((I could have used it at Cancon 2013 for example, and with the Nellies and artillery in here, struck fear into the heart of my more knightly opponents)). Apart from the interest of painting some figures from a different manufacturer (and there are some plans floating in my head about that statement as well – but more on that later), it is an interesting mix of troop types. You can see from the picture to the right that there are a couple of umbrellas to be dealt with – one on the general’s elephant and the other on the cavalry. The Auxilia (difficult terrain troops) will be a mix of the figures to give them that slightly irregular (pardon the pun) look. The maiden guard (look closely, you can work them out) on the other hand will be very regular looking. One of the listed enemies for the Khmer are the Cham – the army is identical so if this works well, I may do it all again but with another manufacturers figures. I’ll also comment later on my Asian wargame armies plan. I’ll post regular painting updates to see their progress – right after I finish that French naval stuff I’m painting. I’ll leave you now with a view from the wall at Angkor Wat (courtesy of Wikipedia). Hmm, I mighty actually have to start taking photos with a proper camera … I do have one but generally end up feeling lazy and using the one in the phone. The Pic isn’t that bad. I actually painted a couple of those Irregular elephants for Martin in Melbourne a couple of years back, and was pleasantly surprised at how nicely they turned out. I seem to recall painting some decorative designs on them too. How was the quality of the rest of the figures? Looking at them, I thought, hmmm. I think they are not to the same standard as many of the other company sculpts but from what I have seen, I would rate them the equal of Outpost wargame figures and for sheer animation, superior to Minifigs. I’ll be taking a closer look at them when I start cleaning up the figures in the near future. Looks like you have an army for day 2 of the DBA comp at CANCON 2014. You just need to decide on an army for day 1. Still, it would be a good challenge. 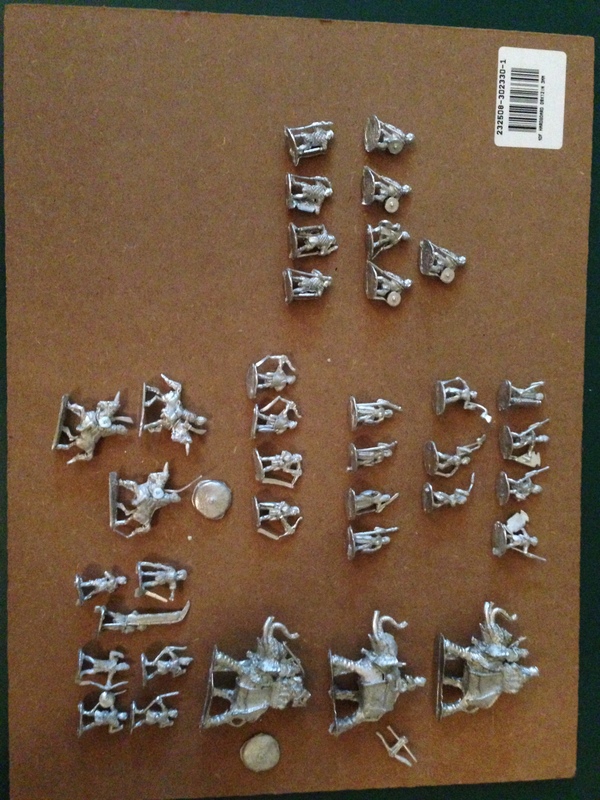 Maybe I will need to consider an earlier S.E.Asian army for Day 1 … assuming I can make Cancon 2014 of course. Does this mean you are planning a two day two army event again? But just think of the elephant based artillery when fighting other elephants! or Auxilia for that matter. challenging might be the best description. Well, there are some Bow there as well as a cavalry element so it could be an interesting opponent for a few folks. I have been asked to run the DBA as a 2 day comp by a number of the players who were there in January. So yes it will be a 2 day comp. Hmm, Cancon 2014 DBA – Day 1, I/49 Early Vietnamese. Day 2 III/23 Khmer. Yeah, that could be a fun couple of days. 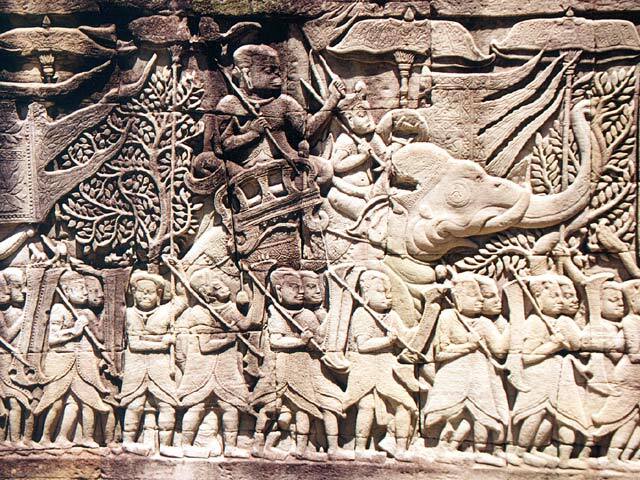 The Vietnamese have elephants, heavy chariot, cavalry, bows and warband – just not all in the same army. And they are an enemy for the Khmer so a matched pair. The Khmer or Cham can also be an ally for those bigger games. I have run a DBA Vietnamese outfit at Cancon one year; it did OK. Bd, Bw, Wb, Bw, Ps, El. The late Viet DBMM army was a different matter.